Rustic Elements Furniture. Don’t let the name fool you. 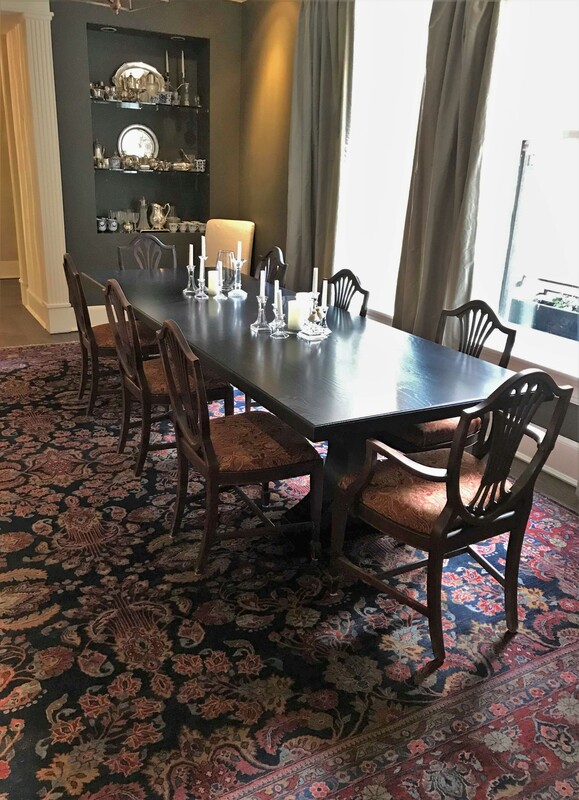 Sure, we are very keen to rustic style furniture, but, we frequently discuss and plan the details of custom furniture with clients looking for something that fits them. We would never look to pigeonhole ourselves to where we build furniture that strictly falls under one categorized design. This blog is here to touch on that and clear up any misconceptions of us crafting furniture that one may think is outside of our design realm. Our style spectrum ranges from traditional and classic to modern and chic, and everything in between. Continue reading as we dive in to styles our customers have sought after, how we achieved their desired goal and how you can take these projects and use them for your own inspiration. What first comes to mind when we say traditional furniture is the overall “timeless” look. We are automatically drawn to our four leg tables, Anchor pedestal, Franklin pedestal, and the Belly pedestal table on our showroom floor. Touching on the Belly, this chic, medium brown-toned stained table features the curves and delicacy of the belly pedestal. Between the common brown color and the unwavering through time pedestal, it is clearly a classic. The belly is an updated design of its lookalike predecessors. We know it is a creation that will be popular as long as your table is standing. Because a classically designed piece of furniture is made to go through years of changing trends, it is important to keep it simple, functional and reserved. On the flip side, we have plenty of trendy customers who are looking for the newest, up-to-date designs and styles to show off in their home and for something that will blend well with pieces they are already accustomed to. We noticed a big wave of customers that were seeking this style absolutely loved the mixing of wood and metal for their custom furniture. It is a romantic pairing between two strong materials. It is also a transitional style tactic. An example of perhaps one of our most transitional pieces on the floor right now, is our walnut slab table. The slab that was cut from the tree was kept as is to retain its unique shape. After finishing it in a gloss, we then put it atop our metal arched base we crafted. Bringing it all together is the walnut cross brace between both pedestals. A stand-out piece that boasts both creativity and a cool vibe. The rustic style of design really hones in on weathered pieces. 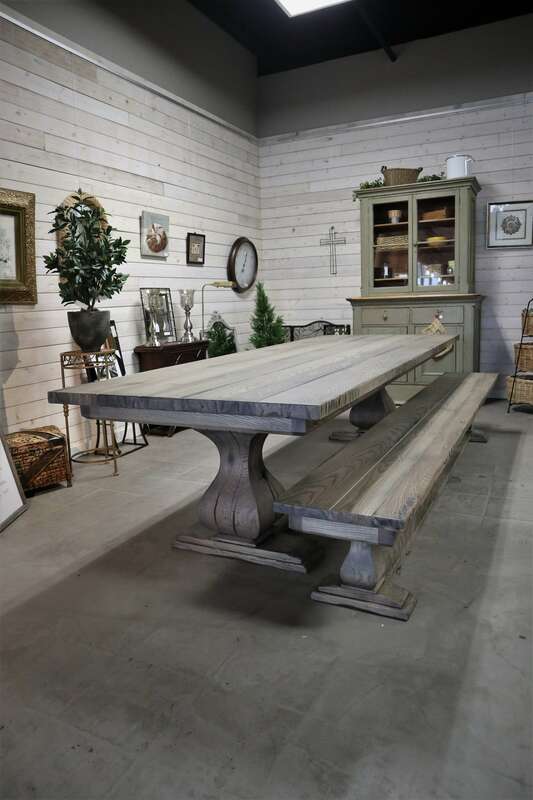 When it comes to tables, specifically, the rustic design leans toward not-so-perfectly straight edges, distressed wood, and grooves in the boards, all elements we consider when building. The name ‘rustic’ itself should bring to mind a well-worn and developed style of whatever is being considered. 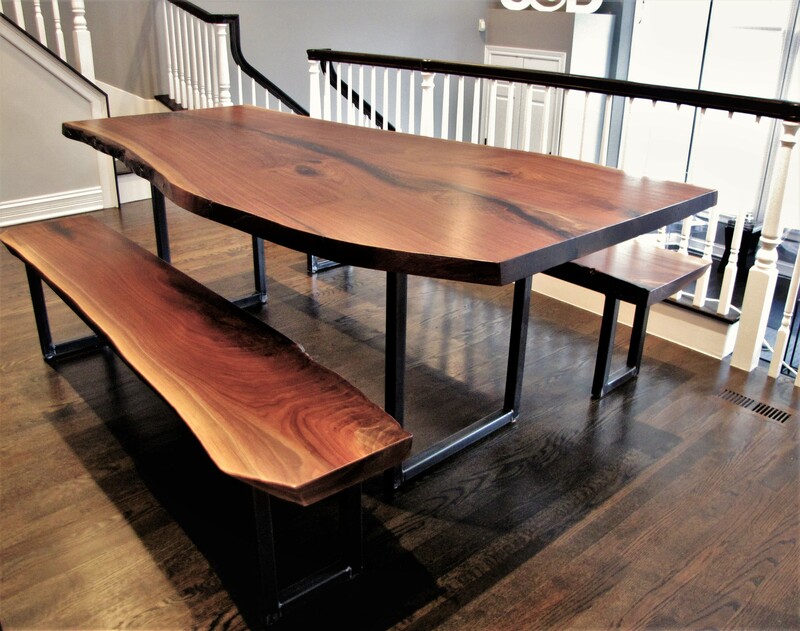 Check out the Arthur table and bench that is on our showroom floor. The pair completely show off a rustic style in its most intense form; different sized boards, a rough, uneven edge, a beaten top, etc. Another table with rustic qualities is our big Belly pedestal table. Although it has distressing and a heavy tumbled edge, it’s on the lower end of the rustic spectrum design in comparison to the Arthur, thus proving there is multiple ways to capture a certain style. A modern designed table boasts a clean style. We frequently point to our crescent pedestal base table on our showroom floor when a customer is in the market for modern furniture. This sleek, Black Espresso-stained table has absolutely no distressing on the top, side or even the base. The crescent pedestal that holds the top up gives a contemporary ambiance. The crescent does not have intricate detailing or cracks like plenty other of our pedestals on the floor have. It also lacks grooves on top. Run your hand across the top of the table and you will surely notice the smoothness. It is a style that definitely catches the eye. No matter what design ideas you bring to us for your own favored style, we will work with you to achieve your set goal. After all, that is the beauty of custom furniture…it is all fit to you. We are not like a big box company where you get what they have chosen for a design, we want your furniture to be long-lasting, durable and, most importantly, you. See for yourself what past customers have said about working with us by checking this out. And if this is something that piques your interest, or you would like to learn more, send us an email here, give us a call, or stop in to the showroom!